Yesterday I disclosed that for 31 Days here I'll be talking about spiritual formation--specifically, about Christian spiritual formation. As I said, all of us undergo formation of our spirits, in one way or another. What comes to your mind when you think about the idea of Christian spiritual formation? Is there something on which you think we should focus? I think there is. It's the root of the word Christian. It's Christ. "The person and gospel of Jesus Christ--building on the simple 'Jesus loves me, this I know, for the Bible tells me so'--is the only complete answer to the false and destructive images and ideas that control the lives of those away from God. 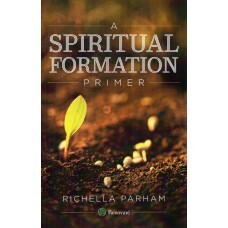 The process of spiritual formation in Christ is one of progressively replacing those destructive images and ideas with the images and ideas that filled the mind of Jesus himself" (Renovation of the Heart, p. 101). Perhaps you went to church today and acknowledged Jesus as your Lord and Savior. I invite you to start thinking of Jesus also as your Teacher. Jesus is not a difficult taskmaster. He's a loving, giving teacher, eager to speak to us, happy to share his Life with us. Jesus said, "I am the vine; you are the branches. If a man remains in me and I in him, he will bear much fruit; apart from me you can do nothing" (John 15:5). My prayer this month is that this little space in the blogosphere will be devoted to learning from the Master. This is a wonderful idea, Richella. I am really looking forward to reading what you have to say. Beautiful post and rings so loud with me. Great way to start my morning before I dress for church. Thank you. I need - Jesus as my teacher. I didn't plan on commenting on each post (since I'm catching up from Saturday), but I just have to say I'm really looking forward to these posts!